A major part of our decision to purchase the cabin was the fact that it had water and septic. We all intemately met the septic tank several weeks ago but held off turning on the water until the threat of a solid freeze had passed – the last big “unknown” to us was if the water would flow. It didn’t. Janeé displays how limber she is while trying to pump air into the pump. 8,367 pumps later and the pressure remains at zero. This guy is headed to the dump. Diagnosis: the shallow well water pump motor was seized and my uninformed opinion was that after non-use for three and a half years the rubber bladder inside the pump had degraded (wouldn’t hold pressure). 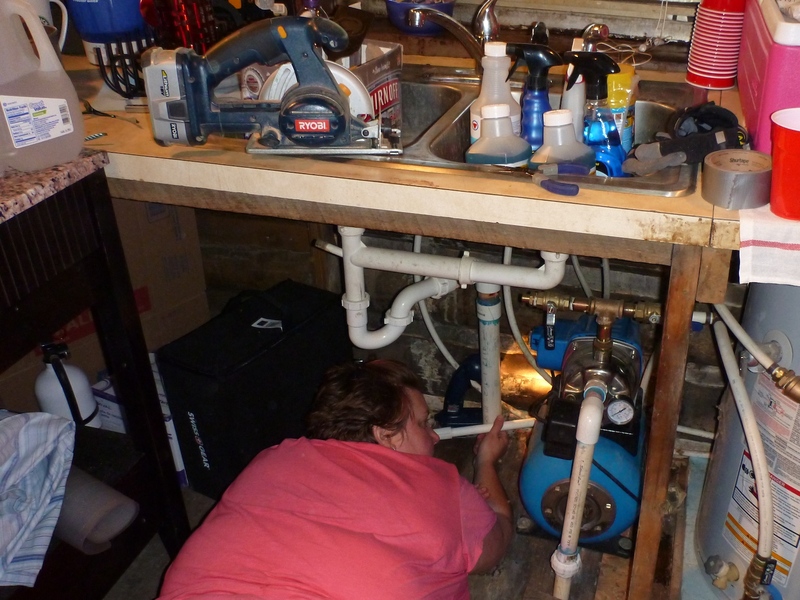 A quick search online and we both exhaled a big sigh of relief – a replacement pump was close to the cost of a kitchen sink and not the many extra dollars we feared. We purchased the same thing sitting under the sink since neither of us have “plumber” in our credentials: a Wel-Bilt Shallow Well Pump. Keep your fingers crossed for a simple installation (yes, that’s sarcasm).